A new Aberdeen version of the famous Monopoly board game is being released. The Granite City has seen off competition from places around Scotland including Glasgow and Inverness to be selected for the special edition. New playing pieces - normally including the top hat, dog and racing car - are to be voted on by the public, so could feature a seagull and an oil rig. The multi-coloured streets will be handed over to leading Aberdeen landmarks such as Marischal College. The makers of the game, Winning Moves UK, said the board would hit shops in October. There was previously an Aberdeen edition in 2006. but it was discontinued. The company's custom games executive Jennifer Lau said: "We studied 20 cities and towns across the whole of Scotland and shortlisted it to three - Glasgow, Inverness and Aberdeen. "Because this version - unlike the first one for Aberdeen, a generation ago - will see the tokens all customised and as (to be) voted by the public, we wanted to make sure the Scottish city the new Monopoly game is being based on has lots of great and distinct Aberdeen links to choose from like an oil rig, a haddock and something depicting granite." 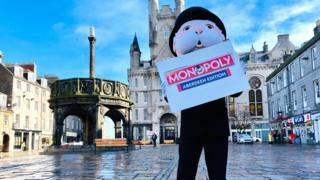 Aberdeen's Lord Provost Barney Crockett said: "This is fantastic news that Aberdeen has been selected for a new official version of Monopoly, which must be the most instantly recognisable board game in the world."